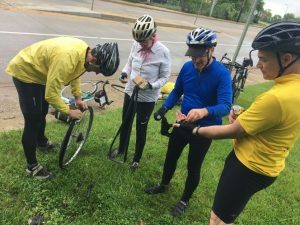 In May 2019, a unique group of bicycle riders will ride from Philadelphia to Washington, D.C. on behalf of Pennsylvania Interfaith Power and Light (PA IPL), a statewide organization dedicated to helping faith communities bring a moral voice to climate change. There will be a mix of Quaker, Mennonite, Jewish, and nonreligious participants, riding together to promote an awareness of climate change issues and environmental stewardship. In D.C., we’ll join with a group of riders from State College and spend a day on Capitol Hill, meeting with congressional delegations to share our concerns about the need to keep environmental sustainability as a central value in their legislative work. 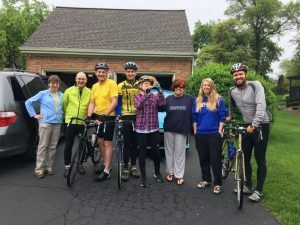 Mike (3rd from L.), John (4th from L.) and Ben (far R.) and their host family in Newark, DE during the 2018 ride. Having done the ride in 2018 alongside Mennonite pastors John Stoltzfus and Ben Wideman, I found it a wonderfully educational experience. Each day along the way we met with faith communities to hear their stories of how they were working to make their communities and cities more sustainable. A Presbyterian congregation in Maryland was eager to share how they became certified as an “earth care” congregation by the Presbyterian Church USA movement; a synagogue in Baltimore shared how they are becoming a neighborhood organizing hub for community activities and urban renewal, including environmental advocacy. I love discovering things and making new friends while on a bicycle. Riding mile after mile alongside two Jewish rabbis, we learned about each other’s faith traditions, finding many common traits such as valuing peace and justice. We were hosted by church/synagogue folks along the route and enjoyed delicious food and gracious hospitality. We met pockets of passionate environmental stewardship folks along the way, all motivated to care for the earth by different faith traditions. It was also stimulating to meet with legislative representatives and advocate for policy to help care for the earth as the future home for my children and grandchildren. I look forward to our May 2019 adventure/advocacy trip and encourage you to follow along through the PA IPL website. Donate online or mail donations in support of the 2019 Bike Ride to: PA Interfaith Power & Light, 210 W. Hamilton Ave. #295, State College, PA 16801.